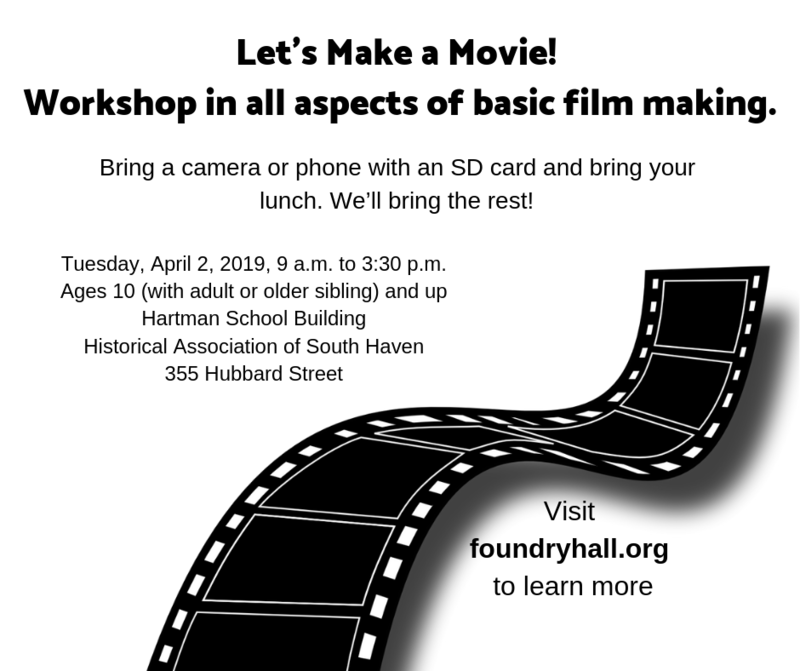 Chicago film maker, Ron Richardson, leads a film making workshop for kids 12 and up (10 and up are invited with a parent or older sibling). 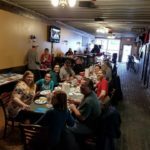 Bring your phone or camera and a lunch! Join us at Epiphany Church (410 Erie St) to celebrate Samuel Nalangira’s 4 month stay in South Haven. We’ll share stories and he’ll share all the music he wrote and recorded inspired by his stay. 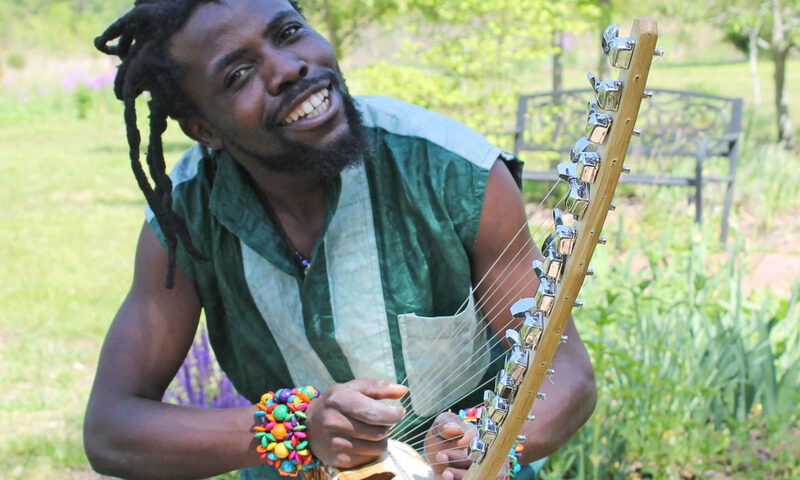 This is a free concert, donations will help Samuel transition to his next stop in Kalamazoo. 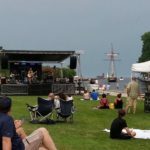 Kicking off the Riverfront Concert Series. 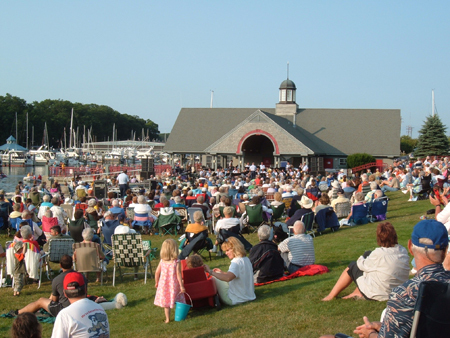 Click here for this summer’s schedule. 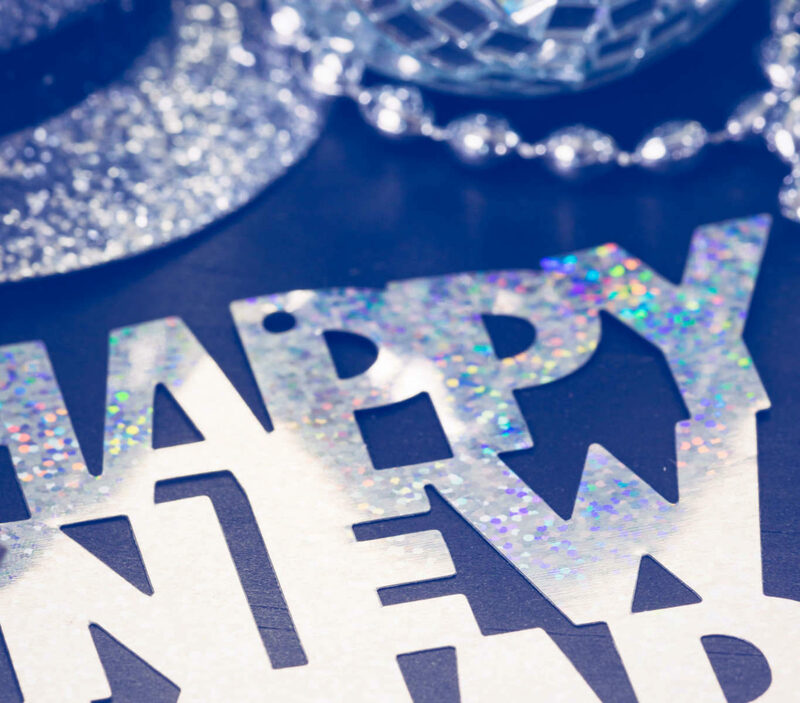 Join us at South Haven Center for the Arts (SHCA) for a family friendly New Year’s Eve Party! We’ll count down the end of the year a few hours early, make some stuff and party! The cost is $10 and you are free to come to one or all three! 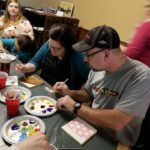 This is a family friendly and tons of fun! Kids under 10 need to be accompanied by an adult. All of these projects were coordinated by Foundry Hall volunteers! 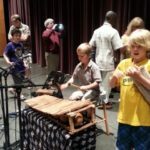 Grant funding, sponsorships and donations are used to pay musicians, sound engineering and supplies. 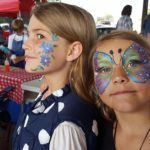 We do an amazing amount of work with our small budget! 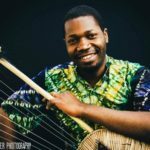 Ugandan musician Samuel Nalangira moved to town for four months to share his music, dance and songwriting talents as well as his good natured spirit. 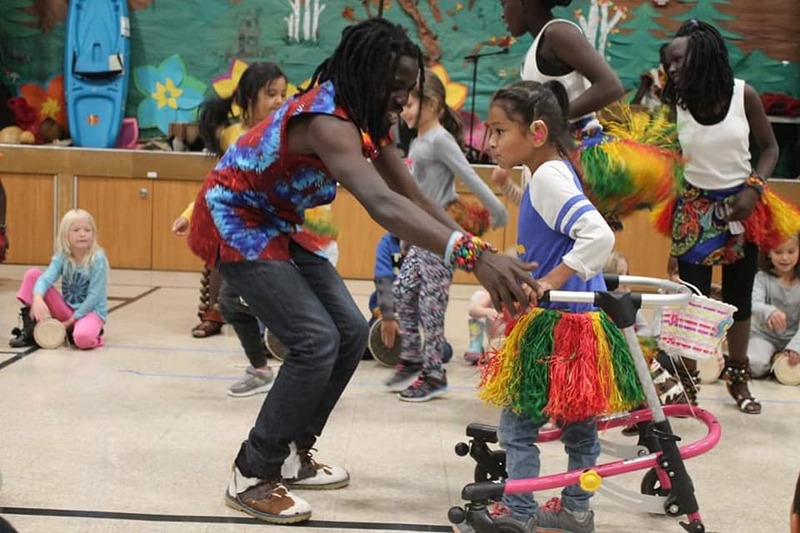 In addition to several community performances, dance workshops in the area schools and for the community, Samuel also created special jam sessions inspiring improvisation and exploration in a shared setting. It was an amazing experience for everyone who participated in these session, especially the teenagers! Read more here.. 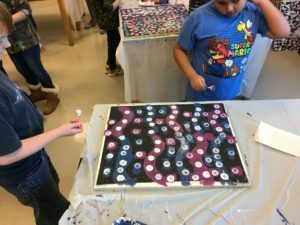 In November, Sh-amp (South Haven Area Mural Project) and Foundry Hall collaborated with North Shore Elementary Students to complete a ceiling mural at the South Haven Ice Rink (rental area). 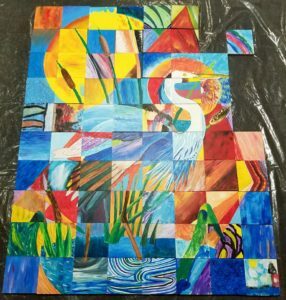 A second mosaic mural project was completed with 8th grade art students at Baseline Middle School. The “Snowy Owl” is on display at the South Haven Ice Rink as well. 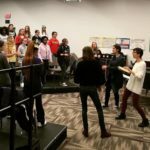 Touring musicians from New York, but originally from Italy, Brazil and Hungary, lead workshops with students for two days and performed for the community October 12th. Read more here! 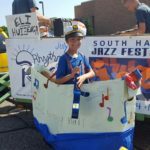 The 2nd Annual South Haven Jazz Festival! 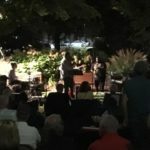 Foundry Hall is pleased to present two evenings of jazz in Dyckman Park for free! 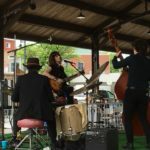 We have created a lineup of fabulous local and regional jazz musicians for the festival and will create again the beer and wine garden under the trees featuring local wine and craft beer. 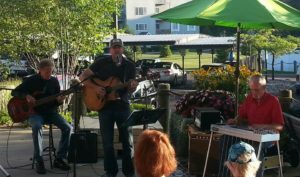 Friday and Saturday 9/14 and 9/15 5-10pm each night. 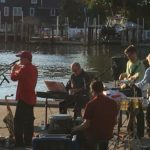 For the full lineup visit our Jazz Festival page. 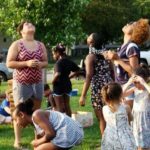 Foundry Hall helped Ward 1 CAC, PUSH, Epiphany Church and YDC create an end of summer community picnic at Elkenburg Park. 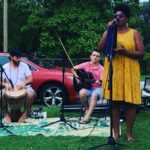 Kalamazoo musician/songwriter Yolanda Lavender performed with her trio for all of the people who came out to share a pot luck meal, play games and commune with their neighbors. 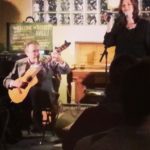 Funds from the Foundry Hall Community Music Fund were used to pay the performers. 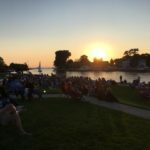 This year marks the fourth year that Foundry Hall has booked, sponsored and hosted the Riverfront Concert Series for the City of South Haven. 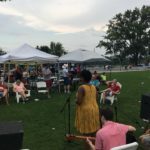 13 concerts took place at picturesque Riverfront park bringing together community members and visitors to the area to enjoy a wide variety of music on Thursday evenings. 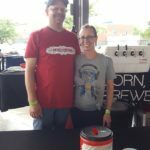 Foundry Hall offered the opportunity to co-host concerts to area non-profits to help raise awareness about their work and upcoming events. 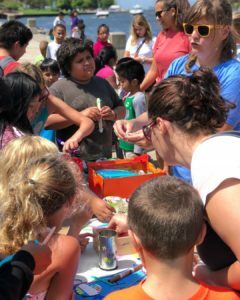 Tunebugs volunteers created a fun activity to add to the SHPS “Books by the Beach” program made possible by dedicated SHPS teacher Heather Chalupa. 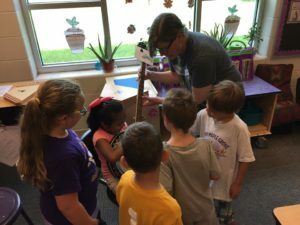 We had fun experimenting with popsicle stick “harmonicas” with lots of young friends. 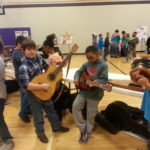 We brought a few instruments along, too, for the kids to learn about and play. 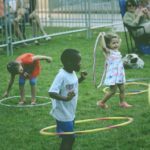 The Forever Curious Children’s Museum “popped up” in South Haven this summer and Foundry Hall created an afternoon petting zoo for its visitors. 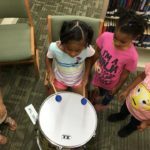 Tunebugs volunteers brought a dozen instruments to the Covert Public Library to share with the summer camp kids at Covert schools. 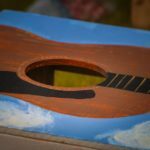 Kids got to learn a little about guitar, mandolin, ukulele, violin, bass guitar, xylophone, drums and other percussion instruments. Then they got to play them all! 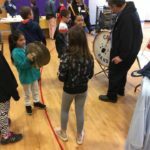 It was a lot of fun and we think we inspired some kids to have fun with music! 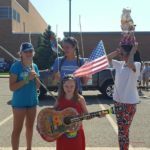 Foundry Hall teamed up with the Baseline Middle School Art Class (led by Sarah Rydecki) to create some fun visual art for the 4th of July parade. 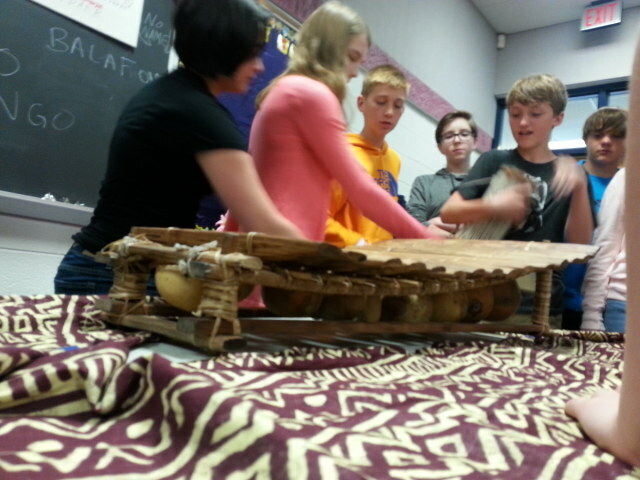 The theme was “Think outside the box” and there were several “make” sessions held to work on the theme. 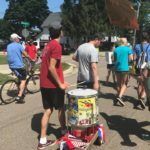 It was a VERY hot day, but we had a lot of kids join us in wishing everyone a Happy 4th of July and encouraging people to “pursue happiness through music and art”. 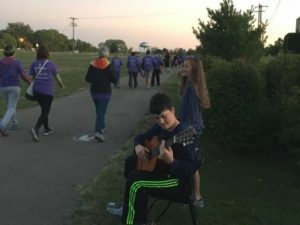 Foundry Hall held another “Get out your guitar” day to encourage guitar players to come together and share what they play, the music they enjoy and get to know each other. 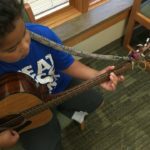 In that same vein, Foundry Hall created a kids Guitar Club that has run throughout the summer. 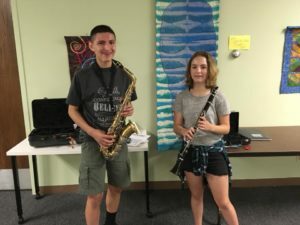 This summer we welcomed two middle school band students to help with our free preschool music program Tunebugs. 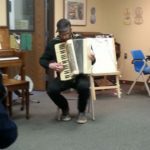 With Yamil on saxophone and Kitty on clarinet we had lots of fun making music and learning about different instruments. 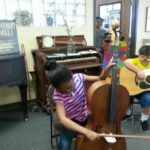 The Foundry Hall Community Music Fund paid each student for this internship. Foundry Hall held a once a month, Sunday afternoon Open Mic at a downtown Douglas bakery this summer. 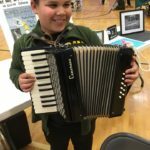 Hosted by Erin Hill Van Horn, there were a variety of musicians young and old getting up to share their talent and music. Foundry Hall loves supporting them by creating these programs. 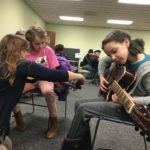 Coming soon: teen open mic! 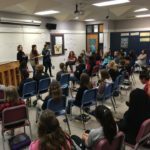 Maple Grove Arts and Innovation Day! 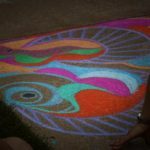 This day is all about how creativity overlaps between music, multitudes of art techniques, science and fun! 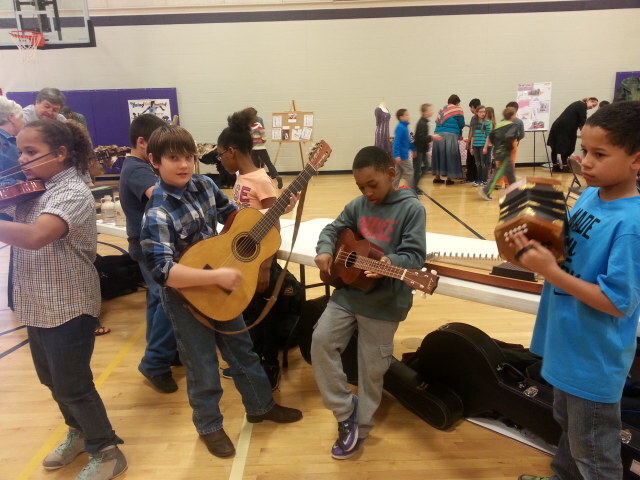 Foundry Hall provided an string instrument demonstration and petting zoo experience sharing a guitar, banjo, soprano and baritone ukuleles and mandolin. 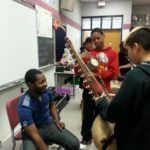 It’a really interesting to see how the kids try out the instruments differently and learn from each other. 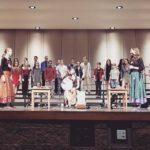 Michigan History Day at North Shore Elementary! 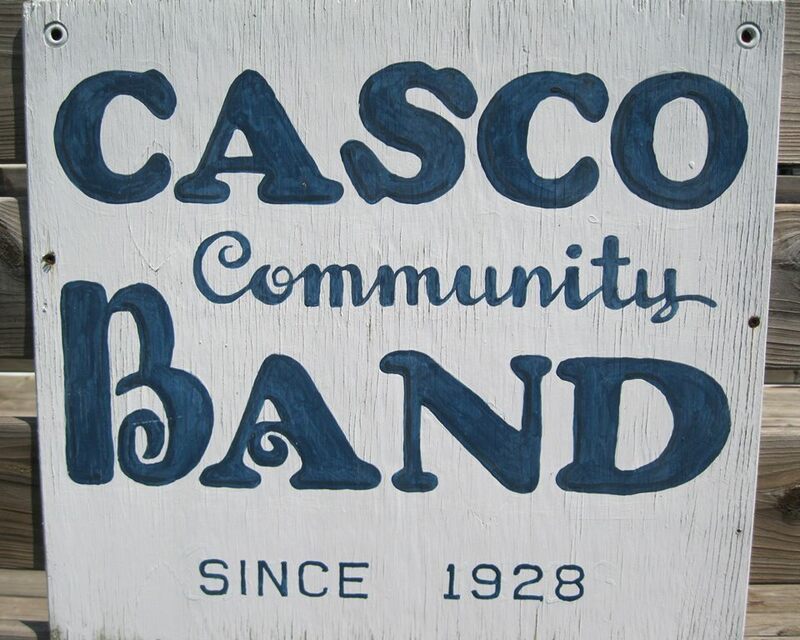 Foundry Hall brought some Casco Community Band history to share with students as they celebrate their 90th year as an all-volunteer big band. 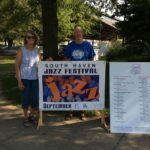 We also shared some photos from the Historical Association of South Haven archives capturing music in South Haven from yesteryear. 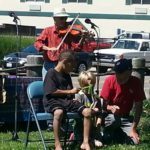 To top it all off we brought in a quartet of instruments for the kids to play including a banjo, mandolin, baritone ukulele and an accordion. 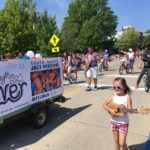 History, music and fun all together! 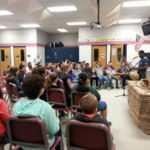 Derek Brown “BEATBoX Sax” at South Haven Public Schools. 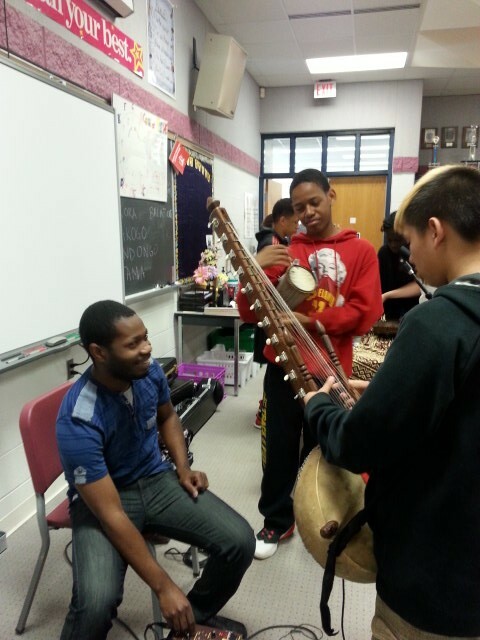 Foundry Hall sponsored the workshops and performance project with professional musician, Derek Brown. 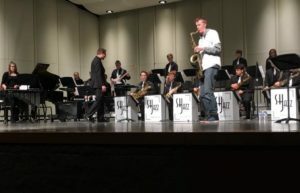 The middle school and high school band students spent a day learning from Derek in their classrooms and then the High School Jazz Ensemble had two rehearsals with him in preparation for their free community performance at Listiak Auditorium. 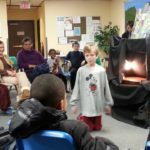 Foundry Hall helped invite the community to the well-received performance. 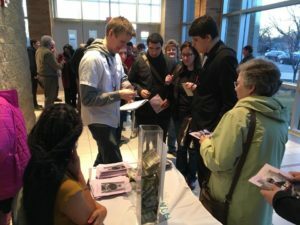 Derek signed autographs, chatted with audience members and students and helped encourage donations for the band’s new Tri-M honors society. 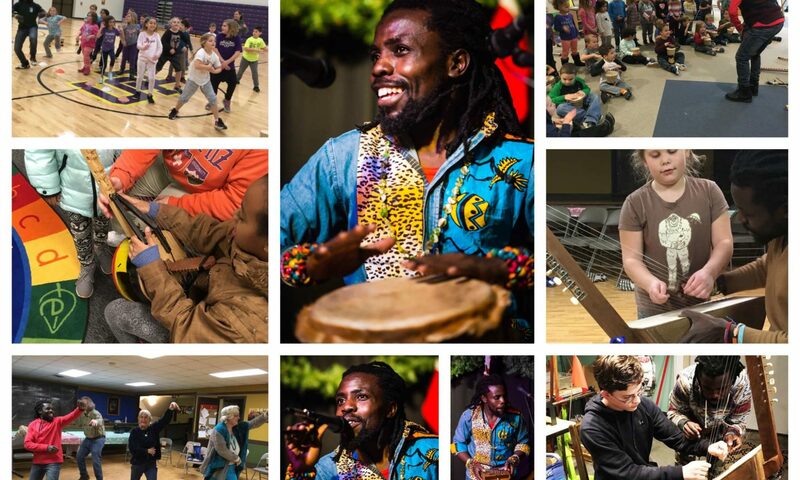 Ugandan musician and educator, Kinobe, returned to South Haven with his new touring group “Dance of Hope”. 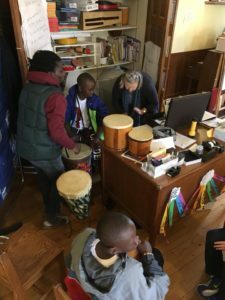 The group featuring 10 young Ugandan “ambassadors”, choreographer and musician Samuel Nalangirla and Kinobe were artists in residency for 6 days during which they led workshops and performed for schools in the area and the community. 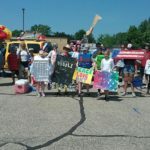 Foundry Hall coordinated with SHPS, St. Basil’s school of South Haven, Glenn School, Fennville Public Schools and Covert Public Schools. 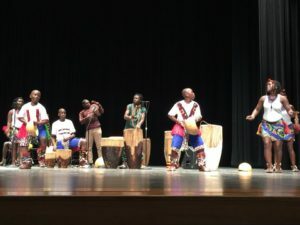 The group performed on Wednesday, 3/21, from 4:30-6pm at Maple Ave Ministries in Holland sponsored by the Alliance for Cultural and Ethnic Harmony as well as a free community concert at Listiak Auditorium on Friday, 3/23, at 7pm. 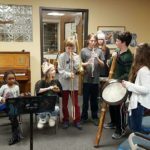 The residency concluded with a workshop and performance at the Citadel in Benton Harbor on Saturday, 3/24 made possible in part by a generous contribution from the Oak Room at the Citadel. 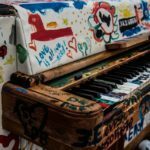 This project was put together by volunteers at Foundry Hall with the help of members and friends contributing housing and meals for the tour. 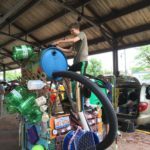 It would not have been possible without the financial support received from the Rotary and Kiwanis Clubs of South Haven, the Albemarle Foundation, Fleming Bros. Oil and a number of private donations from community members. 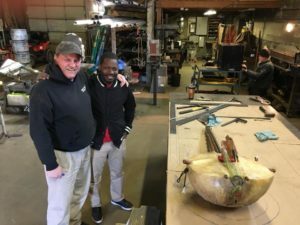 We also helped connect Kinobe with Farren’s Metal Works to create a steel frame case for his African Kora. 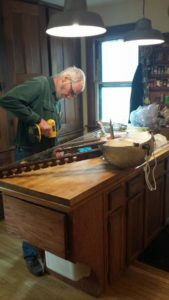 David Ludwig was able to make adjustments to the instrument with all of his wood working expertise. 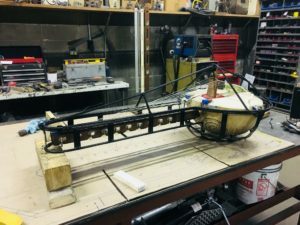 Kora in the case frame – success! 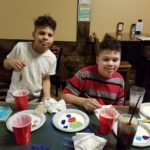 Hopefully this was just the first of many community paint projects. 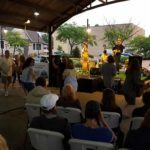 The party was a fundraiser for Sh-amp (South Haven Area Mural Project), which is part of Foundry Hall. 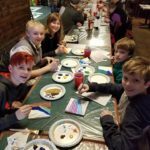 People of all ages came out to the South Haven Brewpub to paint a square as part of a community mosaic art piece. 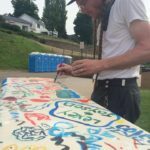 Purchase of a square to paint, a portion of the beer sales as well as the eventual auction of the completed work will all go to help fund upcoming mural projects around town. 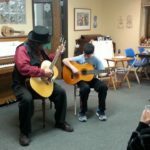 Foundry Hall and the South Haven Memorial Library co-hosted a “Get Out Your Guitar Day” on February 10th. 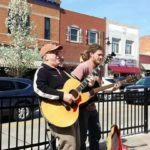 Fifteen guitar wielding people from 10-70 years old attended and talked guitars, gear, music and played a little of their favorite stuff. 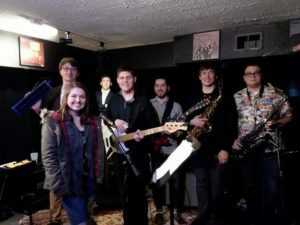 Turbulence, a local band of musicians from SHHS, performed downstairs at the Black River Tavern as part of South Haven’s Icebreakers Festival in early February. 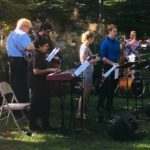 The funky mix of music was led by Foundry Hall community musician, Grant Frabe, on bass. 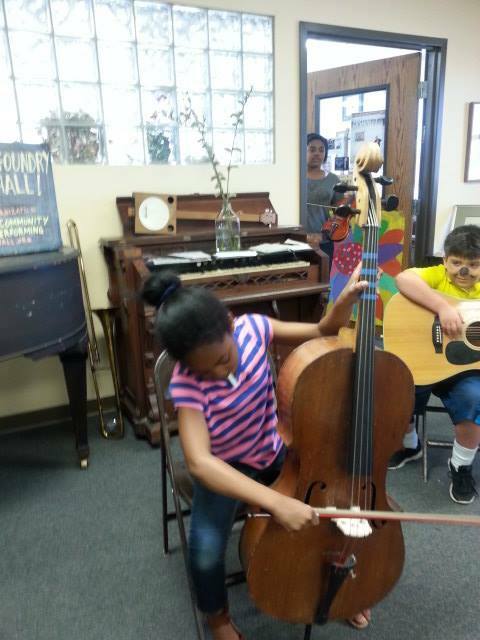 Foundry Hall loves supporting these young musicians! 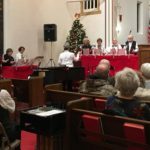 Foundry Hall volunteer Larry Brown put together a showcase of local musicians for a free Christmas concert at First United Methodist Church. 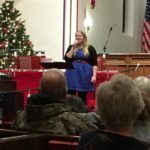 Over $900 in donations were collected at the concert for WE Care INC to help stock their food pantries for local families in need. 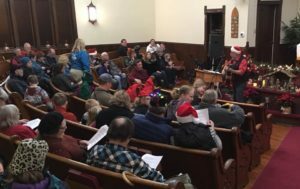 The Festival of Lights committee of Glenn, MI asked Foundry Hall to provide a musician for caroling at their annual post-Thanksgiving, Festival of Lights event. 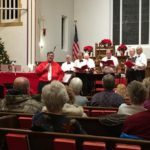 Dan Pierce, a dedicated Foundry Hall volunteer led the singing for the many families that attended. 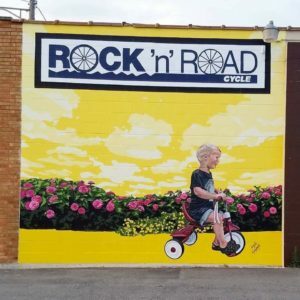 Sh-amp officially opened the completed “Sawyer’s Passage” mural on the side of Rock n Road Cycle with a public party and presentation by the artist, Kayla Wyszynski. 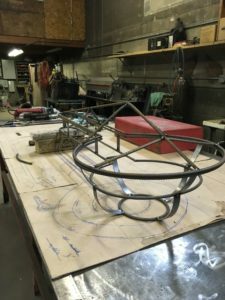 Kayla discussed her process from conception to completion of South Haven’s newest piece of public art. 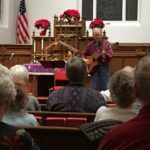 Community musician Steve Barber performed for a free Foundry Hall family concert at the South Haven Memorial Library on December 2nd. 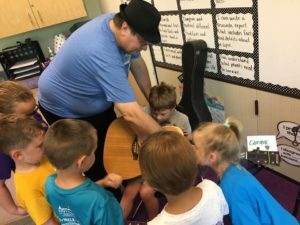 The singer/songwriter/retired principal does such a nice job of telling funny stories and getting everyone to participate as he shares his original music! 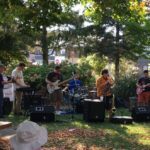 Foundry Hall presents local musicians at the Congregational Church on Phoenix Road during their free community dinners on Thursday nights. 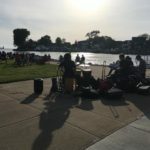 Musicians are paid a small amount from the Community Music Fund and get a chance to share and connect with community members. 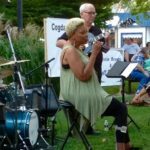 Featuring regional musicians: The Andrew Fisher Quartet, Ivan Akansiima, Edye Evans Hyde, Blue Shoes, the South Haven Area Mens Chorus, Pete Wehle, Grant Frabe, Jazzmin II and the Lake Effect Jazz Band featuring vibraphonist Jim Cooper. 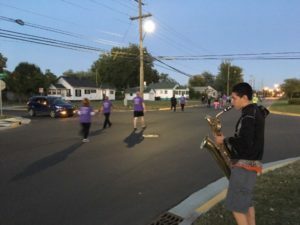 Foundry Hall organized students from the middle school, high school and home-school community to perform along the route of the SHPS Light up the Night 5K fundraiser. 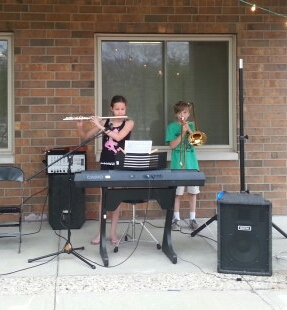 The kids had a great time and earned money for the Instrumental Boosters Club for playing. JigJam, a touring musical group all the way from Ireland, performed at Glenn Square community park. 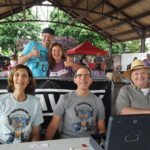 This free show was presented by Foundry Hall and marks the first collaboration with the small community of Glenn just north of South Haven. 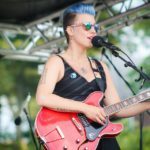 Foundry Hall offers the second annual one-day free Rhythm on the River festival featuring Michigan musicians performing their original music. 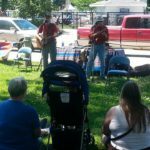 There was lots of fun at this family friendly event and a wide range of music enjoyed while relaxing on the grass at Riverfront Park . 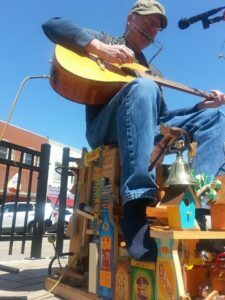 Foundry Hall volunteer Paul Hogan and Red Spirit Retreat (of Fennville, MI) owner Karen Duffin created a series of four music jams to raise funds to send a student to Blue Lake Fine Arts camp in 2018. 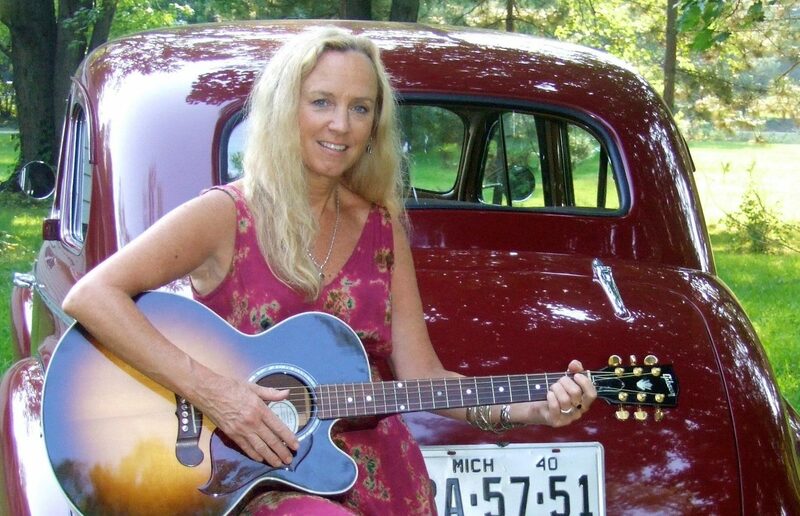 Karen wanted to share her lovely space in Fennville for a music based good cause so she decided to create monthly music jams to raise money for a student in need to go to Blue Lake next summer. 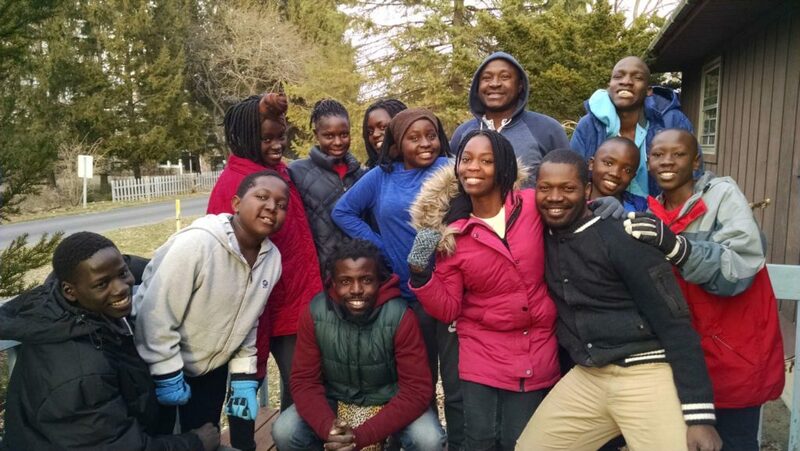 It was a great success (they raised enough for TWO students to go to Blue Lake) and a lot of fun in the meantime! 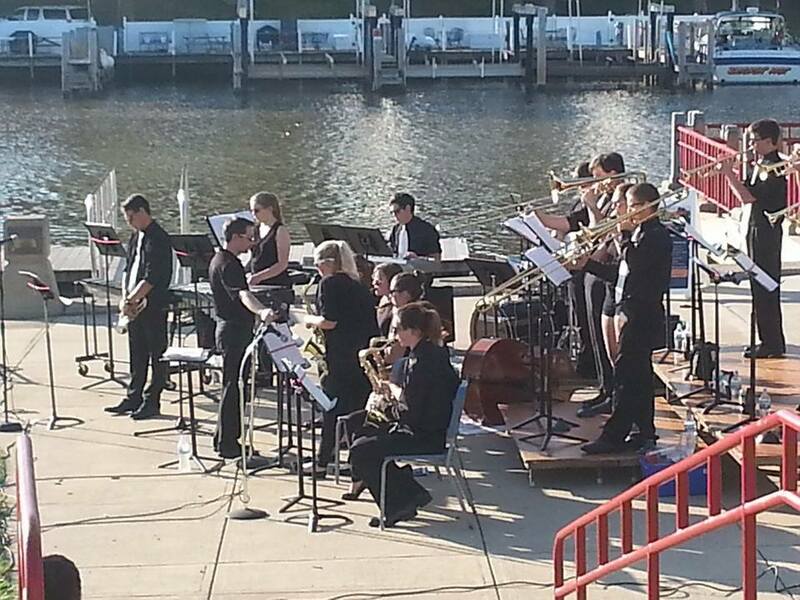 Foundry Hall continues to book and host the Riverfront Concert Series for the City of South Haven with the South Haven Public Schools’ High School Jazz band kicking off the series in late May. 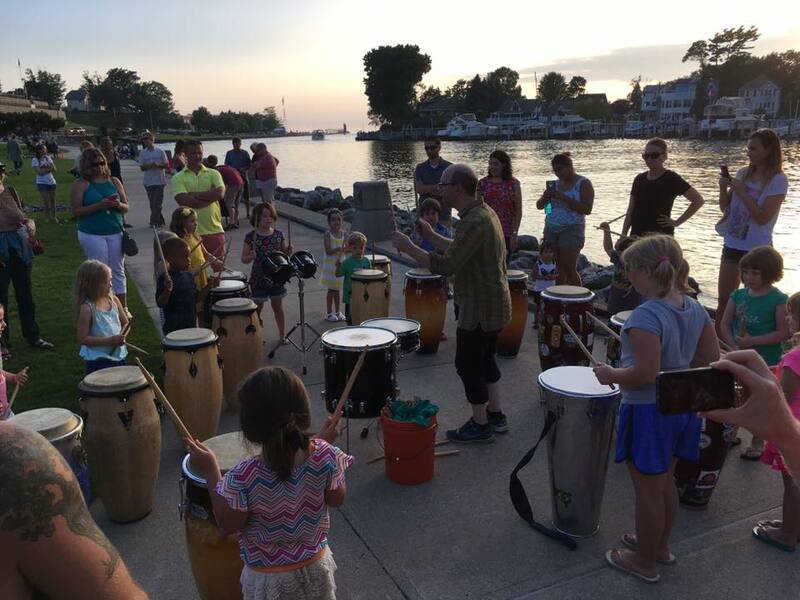 Cabildo’s Josh Dunigan leads an informal drum workshop after their Riverfront Concert Series performance. 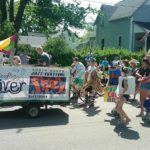 Foundry Hall participated in both the Fourth of July parade (winning best marching band award – we were the only “marching” music) and the Blueberry Festival parade. 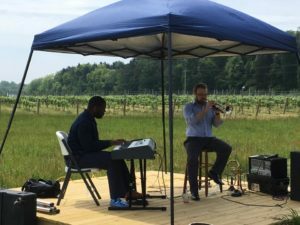 Foundry Hall partners with Cogdal Vineyards to offer a jazz lunch, free admission at the Vineyard featuring Kalamazoo musicians Benje Daneman and Rufus Ferguson. 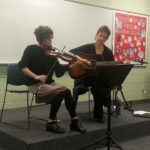 This October, Foundry Hall produced an educational program in the South Haven Schools featuring Michigan musicians, Diana Ladio and Alison Lynn of The Moxie Strings. 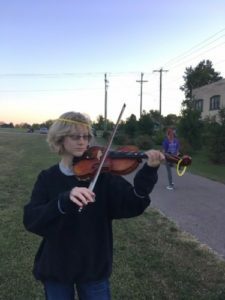 In addition to two days of clinics with orchestra students from 6th to 12th grade, the project also provided a community concert free to all students and open to the community. 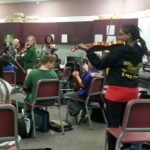 The 75 minute concert closed with the orchestra students performing along side The Moxie Strings joined by drummer, Fritz McGirr. 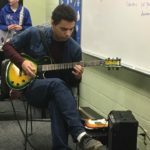 They played songs they had learned in the clinics and everyone had a chance to give an improvised solo. 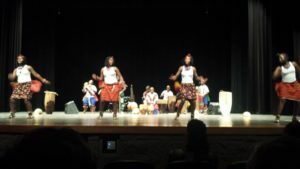 The feedback from students, parents and the community members that attended the performance was overwhelmingly positive. We feel we have given the students a memorable experience that was eye-opening, inspirational and fun. 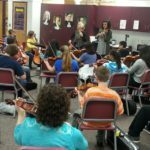 We want to thank SHPS Orchestra director Jessica Fiederowicz for working with us to make this happen. 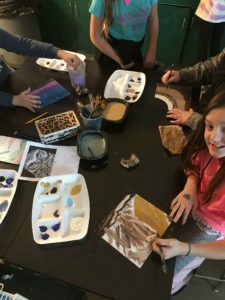 This program was made possible in part by a grant from the South Haven Community Foundation and the Albemarle Foundation. We greatly appreciate their support in Foundry Hall projects. 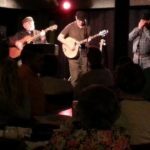 In September, Foundry Hall volunteer and songwriter, Andy Baker, assembled a “songwriter’s circle” with fellow musicians Michael Crittenden and Joe Shields. 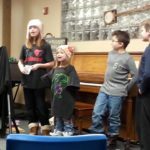 A fun format of taking turns sharing songs, the show was very well received. We’d love to do this sort of thing more often! 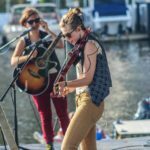 Fall Festival downtown featuring Grand Rapids alt-folk, indie pop, jazz group Olivia Mainville and the Aquatic Troupe and the zany jug band stylings of the Coloma based Deep Fried Pickle Project starting at 12:30pm at the Huron Street pavilion as well as local musicians on the streets all day. 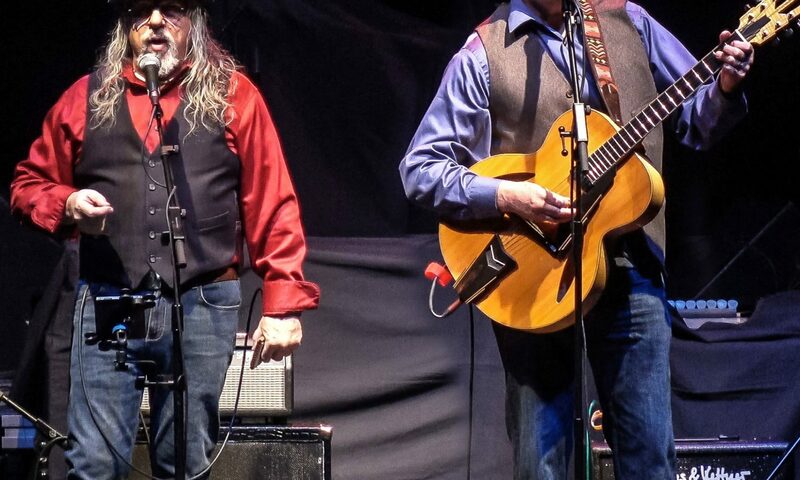 In November, Foundry Hall partnered with Al-Van Humane Society to present Trevor Lewington and Craig Downie, members of Canadian touring band Enter the Haggis at the Black River Tavern. 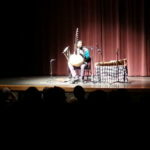 Proceeds from the concert went to Al-Van raising $250. 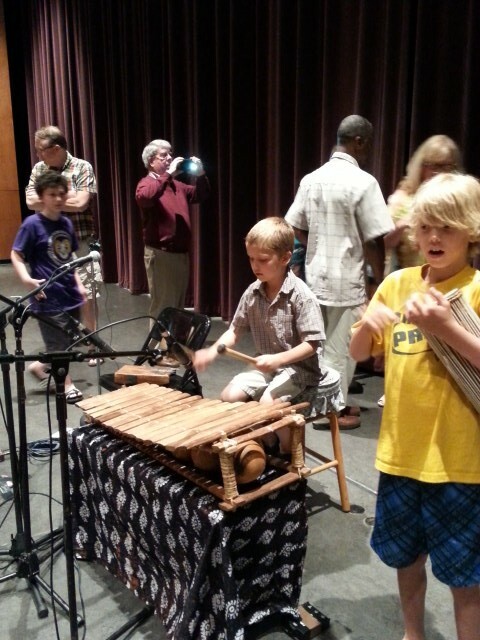 gave a wonderful free family concert that was made possibly by generous donations from supportive community members. 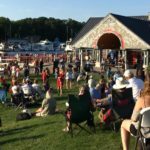 The lawn is a great spot to listen to music on the gentle sloping hill, dance in the grass and watch the boat traffic go by on the river! We will try to use that space more next summer for sure. 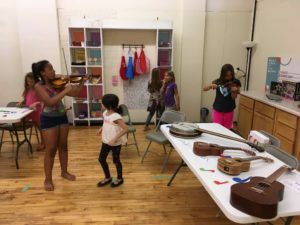 Foundry Hall coordinated a small group of college music students providing music in the Youth Development Corporation (YDC/PAL) day camps in June and July. 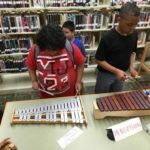 This is the first summer that we have worked with this organization, but we hope to be able to enrich more of their programs with music. 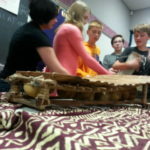 We are very happy to be job creators for these young folks, even if just for a few weeks! downstairs at the Black River Tavern) and corn hole games. 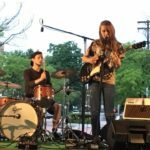 Rising stars and long time Foundry Hall Talent Share participants, Daniel and Isabel Noguera, kicked off the festival with their fantastic original music. 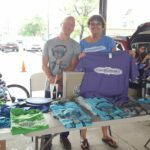 We threw a party/sale at our soon to be vacated office space at the Warren Center (don’t worry we’re not disappearing, just working out shared space for lessons and workshops) on a beautiful Sunday afternoon in July. 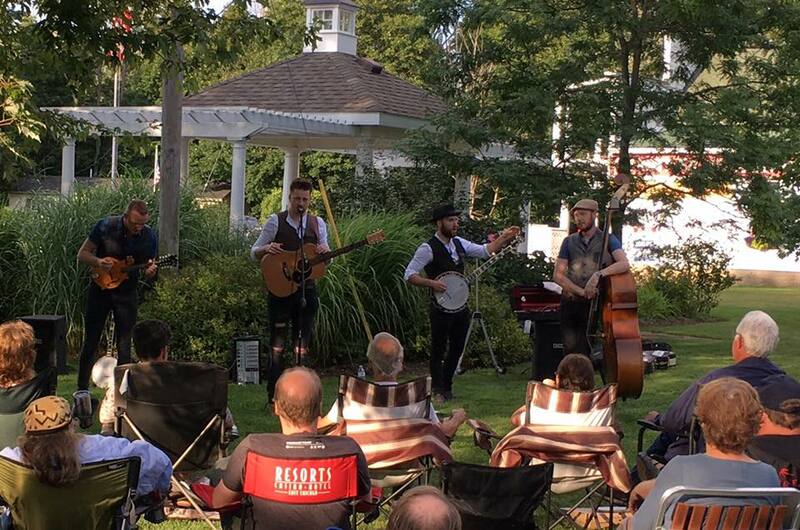 The South Haven Area Mens’ Chorus and our own music educator Doug Peterson perfor med in the late afternoon and then traveling musicians Drew Gibson, Jon Nazdin and Dave Hadley provided lovely entertainment on the patio that evening. 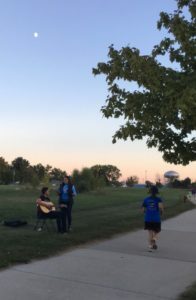 Finishing up the summer, local (Benton Harbor) musician and LMC student, Chris Kang, performed on the patio at the Warren Center announcing his upcoming CD release. 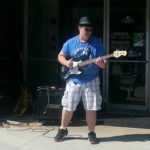 Gobles musician, Andy Baker, performed his original work at the Black River Tavern. Foundry Hall coordinated local musicians for Spring Fling party in downtown South Haven on Saturday, April 23rd. 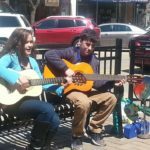 Thirteen musicians, young and old, performed on the street corners to help create a festive environment. 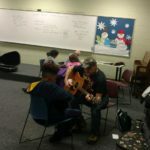 Foundry Hall paid a small stipend to each musician for their efforts from the Community Music Fund. 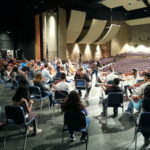 This was a great opportunity for a lot of young musicians to try out informal performance and to meet other musicians. 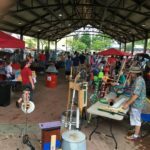 It also exposed lots of people to a variety of music styles and instruments. 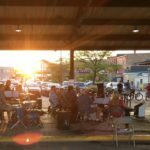 In May, Foundry Hall hosted two free community music concerts. 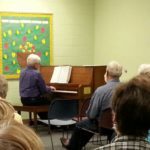 Local piano student, Hannah Jessup, performed her repetoire at the library and Joe Foster and Ron Van Lente who perform together as “Silver Threads” were featured at the Warren Senior Center. 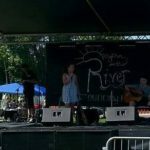 Andy Baker performed a the Black River Tavern (downstairs venue) as a community concert as well and we joined by the Silver Threads for a couple of songs. 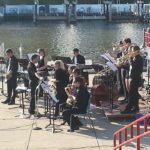 The Riverfront Concert Series kicked off on May 26th with a performance of the South Haven High School Jazz Band directed by Jeff Bopp. 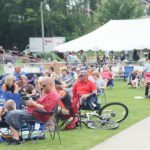 Foundry Hall ha s partnered with the City of South Haven to book and host the Riverfront Concert Series, a series of free concerts on Thursday nights from late May to Labor Day. 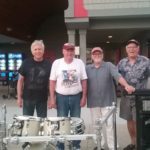 Foundry Hall hosted more Community Music Concerts including Pete Wehle‘s return to singing Frank Sinatra’s greatest hits and local musicians, Star and Charlie. 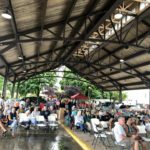 Foundry Hall added to the Ice Break er festivities in town by hosting the Deep Fried Pickle Project along the chili tasting tour. 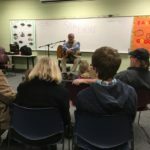 Danny Donuts livened up the library’s Ice Breaker story hour, as well. 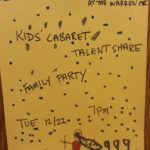 Our monthly Kids’ Cabaret Talent Share continued through the winter with lots of fun music making, story telling and puppeteering creating a time and place for free creativity with friends and family. 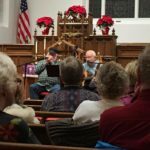 “A Gift of Music” Performance Series at the South Haven Memorial Library. 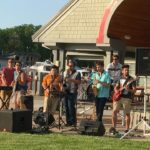 The series showcases a variety of music performed by talented, local musicians and is free and open to the community. 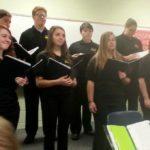 Featuring Roger Ransom, Eden Morris and Michael Vanden Tak, a South Haven High School Choir Ensemble led by Katie Hillyard and Erin Hill Van Horn and Catlin Nell Lancaster, the Library and Foundry Hall give the gift of live music this holiday season in the comfortable Library community room. 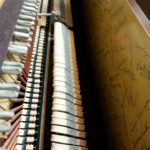 Foundry Hall, with the help of Roger Ransom, are maintaining the library’s Everett Piano. 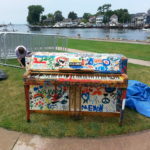 This was the last piano made at the Everett Piano factory in South Haven in 19 86 and was donated to the City of South Haven. The inside of the cabinet is inscribed by the employees of the Everett Piano Company, then owned by Yamaha. 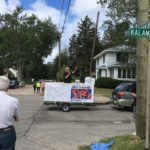 Families from South Haven and the surrounding area hosted a traveling dance group from the Czech Republic this past August. Coordinated by Foundry Hall twenty-one members of the dance group Dance Studio Light of the Na Popolce School in Prague visited South Haven for two days en route from Blue Lake Fine Arts Camp to Chicago. 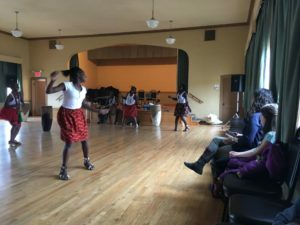 They gave a very well received, free performance for the community on Thursday, August 21st at the First Hebrew Congregation Synagogue which the congregation let us use for free. 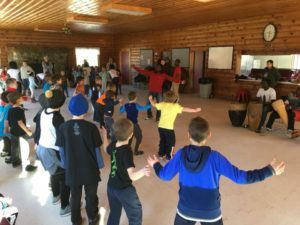 Foundry Hall was excited to be contacted by Blue Lake Fine Arts Camp and happy to bring together so many people for a cultural exchange and performance opportunity and we hope to have more opportunities in the future. 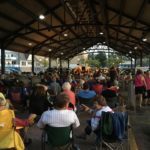 Foundry Hall has hosted the Riverfront Concert Series with the City of South Haven this summer. 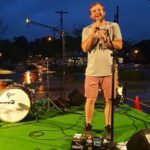 We will do our best to carry on this long standing series offering a variety of local and regional musical talent and genres. 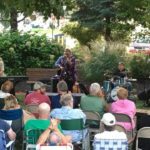 Concerts are Thursday evenings in the summer at Riverfront Park on Water Street. 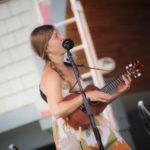 Foundry Hall and South Haven Center for the Arts are presented professional harpist, Laurel Federbush, closing the Talmud: Marc Chagall and Ben Zion exhibit at SHCA on July 24th, 6-7:30pm. 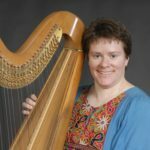 Federbush has composed original music based on the Jewish Bible for the harp and will perform for the community at this free event. 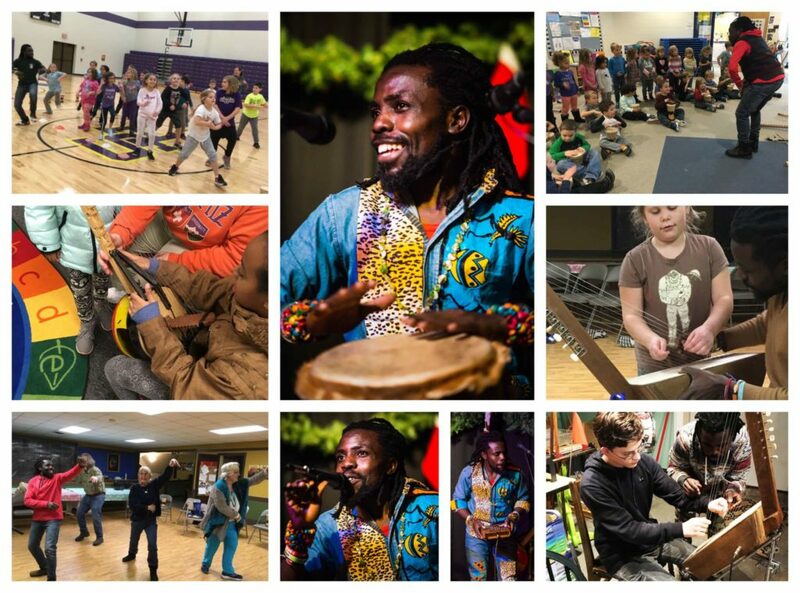 Earth Day Celebration with Transitions South Haven, Michigan History Day at North Shore Elementary with the Historical Association of South Haven, Arts Day at Lincoln Elementary and a four day African music project featuring Ugandan musician and educator, Kinobe. 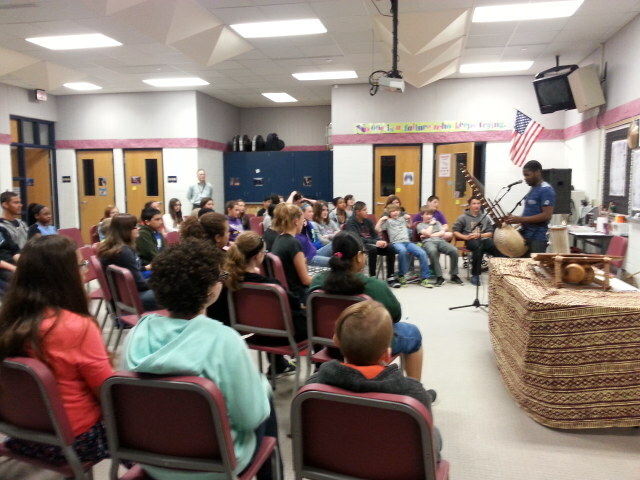 Kinobe led workshops and performed for the students at Baseline Middle School. Foundry Hall obtained funding from the South Haven Community Foundation, South Haven Public School Foundation to make this possible. Foundry Hall coordinated with the school and provided technical assistance for the program. 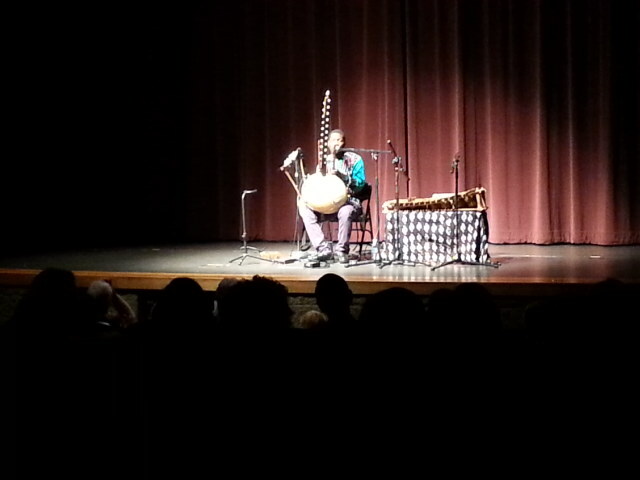 In addition to the day at Baseline, Kinobe gave two performances reaching all of the students at Covert Public Schools. 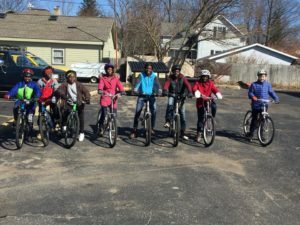 We greatly appreciate a donation from Suzanne Blair as well as the funding from the Covert School District that made this program possible. 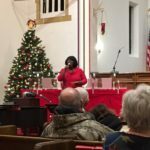 Foundry Hall provided opportunities for the general community as well facilitating a workshop at our Warren Center location as well as an evening community performance at Listiak Auditorium in South Haven. 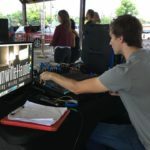 Coordinating this event for our community and particularly for so many students was a very satisfying experience for the Foundry Hall volunteers and we hope to create more opportunities like this in the future! 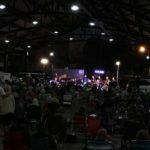 September: Foundry Hall hosted Blues Benefit Concert for South Haven’s Sister City, Quilali, Nicaragua featuring the Elwood Splinters Blues Band. 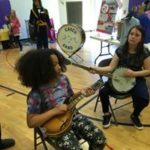 March: Foundry Hall hosts and organizes SPRINGFEST: Liberty Hyde Bailey’s birthday bash with music performances and jams, instrument petting zoo and crafts.